The best diving on the west coast of peninsular Malaysia is around Pulau Payar, 15 nautical miles south of Langkawi Island. The four islands in the marine park boast a wide variety of corals and marine life although visibility is not great, ranging from 5-20m. There is no accommodation on Pulau Payar but boats from Langkawi dive operators visit the dive sites. 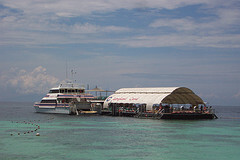 There is also a large floating platform with and underwater observation deck which is popular with daytripping discover scuba divers and snorkellers. On the south west tip of Pulau Payar, a dive site of boulders drops down to 18m deep. Crevices in the rocks are full of life including moray eels, lionfish, scrorpionfish and crustaceans. Snapper and fusilier can be seen along with many other reef fish on the coral gardens. Another dive site called “Grouper Farm” is home to lots of large grouper. Lobster Garden is full of lobsters. Pulau Kaka has an artificial reef made up of confiscated fishing boat wrecks. Maximum depth is 18m. The wrecks are home to snapper, fusilier, surgeonfish and soldierfish. Pulau Lembu has three dive sites including Lembu Rocks and Rock Point where coral covered rocks are home to many schools of fish. Pulau Segantang has several dive sites with slightly better visibility and abundant marine life. Nurse sharks are often seen here. Anemone Garden is a popular and colourful dive site on the north side of the island.